Make your wedding or party unique with these lovely satin cockades! Victorians often used cockades as favors for the guests, gifts for the wedding party, or as a way to designate special people in the event. Cockades were part of the royal wedding celebration of the Prince of Wales in 1863. 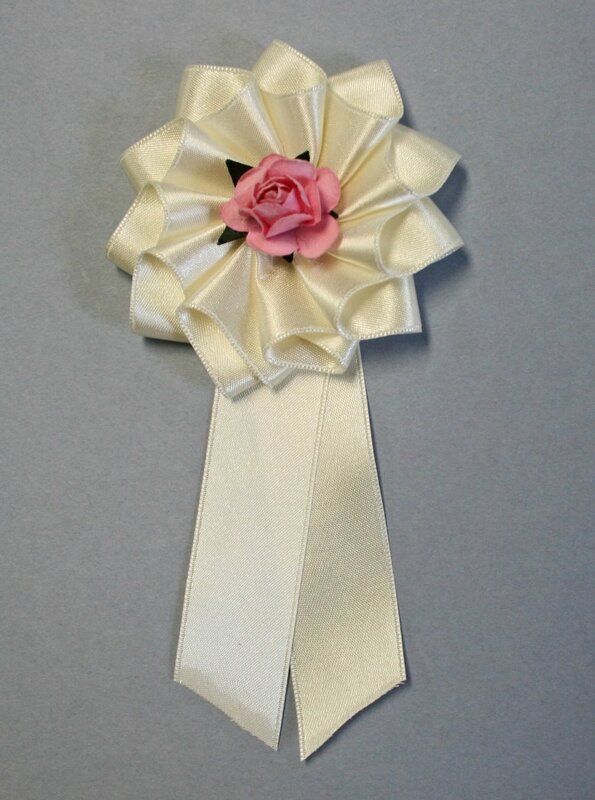 Your cockades will be made of quality ivory satin ribbon with the flower color of your choice in the center. The flowers are created in vintage fashion from parchment. The cockades will have silver-plated pin backs so you and your guests can easily attach them. I can also do a custom center emblem of your choice. These will be made to order so allow 1 week plus shipping time. Approximately 2.5" (6 cm) across rosette. Streamers are approximately 2.5" (6 cm) long. Pin back is silver-plated and 1" (2.5 cm) wide. For more information on Victorian wedding cockades, see my blog entry here.